Abu Dhabi, UAE, June 11th 2018: The Fatima Bint Mubarak Ladies Sports Academy (FBMA) announced that it has contributed a plethora of books to the Abu Dhabi Ladies Club (ADLC) seeing the construction of the first dedicated sports library in the UAE: The Fatima Bint Mubarak Sports Library. A myriad of scientific, administrational and inspirational books in both Arabic and English are available to fulfill the desires of every reader. Under the patronage of H.H. Sheikha Fatima bint Mubarak, Chairwoman of the General Women's Union (GWU), President of the Supreme Council for Motherhood and Childhood, and Supreme Chairwoman of the Family Development Foundation (FDF), “Mother of the Nation”, FBMA made this contribution in efforts to align with the mission of its Education and Research department to “fill the educational gaps that exist in Sports in the UAE”. The library has been designed to make information easy and accessible to the Abu Dhabi community, as the FBMA strives to increase the number of women practicing sports but also the number of women in the sports industry. And this is why the carefully curated library hosts a number of books on sports journalism, photography, marketing, sponsorship, physiology and more. Commenting on the newly opened facility, Dr. Omnyat Al Hajeri from FBMA said: “The launch of The Fatima Bint Mubarak Sports Library is a major step in the growth of FBMA, as the academy continues to thrive since its inception in 2010. This world-class facility has filled the gap in education in sport that once existed, providing fast and easily accessible material for our community. As a non-profit organization the FBMA dedicates the entirety of its work to growing and bettering the community. With this in mind, the development of the FBMA library is another building block in the path of change and progress that the FBMA has taken. The Fatima Bint Mubarak Sports Library will reside within the Abu Dhabi Ladies Club library and will be open to the Abu Dhabi community. The books have been carefully selected by a team of specialists at the FBMA, Launching with 800+ books. 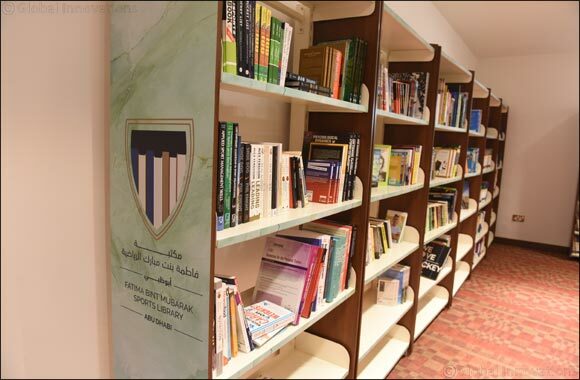 The library will be an ever-evolving, vital element within the eco-system of sports in the UAE.